Multimedia-enhanced learning experiences engage the students and make the learning process an enjoyable journey. Fun learning is not a myth anymore! Young learners thrive in environments that provide multiple means of assessing information and knowledge presented in various formats. With the right kind of multimedia tools, tutors can capture attention, engage learners, explain difficult concepts, promote information retention and inspire creativity. 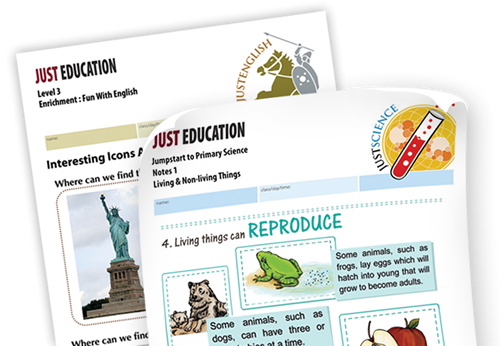 User-friendly and comprehensive materials to help your child grasp new concepts, apply new knowledge and develop higher order thinking skills. The Outcome: Significant Improvement In Academic Results! With each lesson, your child will become more confident and receptive towards approaching challenging questions and learning new techniques. JustEdu has the best interests of our students at heart and adopts a very stringent standard in our recruitment and selection of tutors. Through regular evaluation procedures, we ensure that tutors maintain the highest teaching standards and fulfil the 5 ‘C’s requirements set by our company. At JustEdu, you can be assured that your child is given the best guidance on his/her learning journey. At JustEdu, we recognise and appreciate that every child is unique and requires individual attention from time to time. With such a firm belief, we provide additional one-to-one consultations to our students completely free-of-charge. This personalised programme aims to address any query raised by our students in the course of their studies. As we remove the stumbling blocks to their learning progress promptly, students’ self-confidence gets a boost. In turn, they become motivated learners as they actively seek to improve themselves. We are committed in developing our students to be independent thinkers. We cultivate a ‘can do’ belief in our students through our tutoring, coaching and mentoring approach. Armed with this belief, they overcome their self-doubt and mental barriers to strive for educational excellence.